Something’s amiss with the young women of Los Angeles, as the case has been as long as people have been making movies about Movietown. 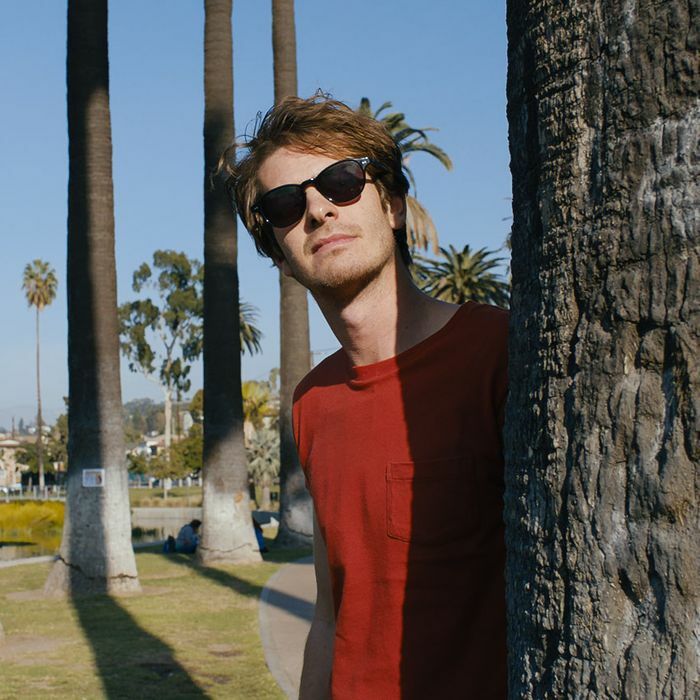 But it’s much easier to notice in the Los Angeles of David Robert Mitchell’s Under the Silver Lake, and not just because the city seems to be almost entirely populated by headshot-armed 18–25-year-olds looking to make it big. There’s a kind of florid defensiveness to their styling; everyone’s doing the superficial most while keeping their personalities pliable and agreeable and casting-friendly. Meanwhile, their outfits — wide-brimmed hats, abstract face paint, dresses of gold brocade and PVC expressly meant to draw the eye and keep everything else out — grow up around them like hackles. Lost among them is Andrew Garfield as Sam, an apparently unemployed loser, perpetually stoned and looking in dire need of a shower, yet still somehow able to get it on occasion. It’s not clear what Sam is doing in L.A. or what he intended to be doing, but when we meet him he spends most of his time masturbating, playing Nintendo, looking for encoded messages in old VHSes and pop-culture ephemera, and spying on his female neighbors. He’s living a shitpic copy-of-a-copy of The Long Goodbye; he’s Philip Marlowe if Philip Marlowe spent way more time on Reddit. Between this paranoid slacker and the metropolis of strenuously effortful women and a select few powerful men that surround him, Mitchell has crafted a deliberately overwrought mystery that almost feels like a work of interpretive (to put it mildly) anthropology. We follow Sam almost exclusively as he wanders from party to baroquely alienating party, uncovering the hidden secrets he always suspected were there in the fabric of the city and the pop culture it produces, gaining access to underground lairs and impenetrable fortresses. If this sounds a little familiar, then yes — this is a kind of stoned Angeleno Ready Player One. But it does Spielberg’s film one better by actually building a world — also a dysfunctional, demographically skewed and extremely male-gaze-driven one — and, on some level, trying to understand how it wound up this way. Sam’s adventure starts when his neighbor, Sarah (Riley Keough) disappears seemingly overnight, her apartment vacant. He barely knew her, but they share a kiss the night before her disappearance, and he becomes obsessed with figuring out what happened to her. There’s plenty to be suspicious about, including a roving girl gang led by Zosia Mamet that he catches snooping around the vacant apartment, the simultaneous disappearance of a billionaire mogul, a roving dog-killer, and a cultlike goth band with a ubiquitous earworm of a song. It must all be connected, right? Maybe. Sam’s not the most reliable pair of eyes to peer through, and his propensity for manic conspiracy theories drives away at least a couple people in his life. Like select works of Thomas Pynchon or David Lynch (both of whom Under the Silver Lake is heavily indebted to, while for the most part remaining a product of its generation) you kind of wade in knowing the water is teeming with red herrings, and that some of the mysteries will remain mysteries. Like any conspiracy theorist, you sense that landing on an actually airtight unified theory would almost spoil the fun for Mitchell. People who hate Los Angeles — its supposed superficiality, its flakiness, its permanently unknowable foggy corners, its refusal to finish a sentence without a question mark — will likely be driven bonkers. But perhaps, they’ll be right to. I kept coming back to the women in this extremely boy-driven movie — Mitchell suspects that they’re all on one big conveyor belt to be chewed up and spit out by Hollywood, or if they’re lucky, locked away in the dungeons of the rich and powerful. It’s a rather pedestrian imagining for an otherwise admirably cuckoo film — you keep hoping for Mitchell to land on something weirder, more radical. They’re the wallpaper of the film, set dressing and Greek chorus, and pretty soon the commentary on how Hollywood uses women as decoration outweighs the fact that Mitchell’s just repeating the cycle — albeit with better-than-average outfits. After all the rabbit holes and secret codes and hidden messages, Under the Silver Lake is just sad it’s not getting laid. But if that doesn’t sound like a movie for our time, I don’t know what does.